When my daughter Sarah was born six years ago, we had no idea the journey that would be in store for us. And as I write this, I realize that genetics has played a large role in shaping what we have or have not done for our family. It began during pregnancy, when we opted for the noninvasive first trimester screening that checks for Trisomy 18 and 21, along with the nuchal translucency ultrasound. Neither revealed any cause for concern. Because of these test results, along with our ages and doctor recommendations, we opted out of the Triple/Quad Screen and amniocentesis both usually performed between 15 and 20 weeks of pregnancy. We became slightly worried when our 20 week ultrasound did reveal a potential for small hydrocephalus, or fluid in the brain. But no one seemed too concerned since the weekly ultrasounds that followed remained consistent through the rest of the pregnancy. We tried not to worry but my motherly instincts had already begun to kick in. I distinctly remember reading an article on autism and thinking that I needed to hold onto it as it had valuable resources my family would need (though I also sensed we would not be faced with autism directly). I remember trying to push the thought out of my mind, willing it not to be. And while I never spoke to anyone about my premonition, looking back, it is funny to me that I could have already known something was not quite right. My daughter Sarah was delivered full term via C-section due to breech position, and it was not until then that we truly knew something was wrong. Within hours she was diagnosed with a tracheoesophageal fistula with esophageal atresia (TEF/EA) and would require surgery. She was transported to our nearest children’s hospital. My husband accompanied her on that trek and was bombarded with decisions no parent should have to make. The genetics team was immediately involved, as it was determined that she had several markers, such as webbed neck, ear pits, recessed ear lobes, simian creases, and mild facial dysmorphia that indicated a genetic disorder was present. As I had majored in biology as a college undergrad, there was no hesitation. My daughter would undergo preliminary genetic testing to count her chromosomes and check for banding. Over the next week as these tests came back normal we became more optimistic that our daughter’s issues would be minimal and corrected with surgery. We focused all of our efforts on getting her healthy enough to come home, while the physicians focused all of their energy on performing every test imaginable to find more and more concerning health issues. We left the hospital six weeks later knowing more medical words and anatomy information than I could keep track of. We were disheartened when we were given an appointment with the genetics team six months from the time we left the hospital. In the meantime, we were told no additional testing would be performed, as this is typically discussed and determined outpatient and not bedside for a child, an absurd hospital rule. Being a biologist at heart, I was determined to find answers to what happened instead of allowing my mind to wonder why it happened. Naively, I thought if I knew what was wrong I could research enough to find out how to fix it, have the answers to all my questions, and maybe rationalize the why. After all, I had just spent 45 days at the hospital and 45 nights online Googling every medical term I had in my vocabulary. I was in search of answers to help me cope with the here and now and the future of my daughter. The weeks following discharge brought appointments with several doctors. As we left each of them, I quietly asked whether there was anyone else who could help us to make sense of it all. The answer came when we were referred to a wonderful and compassionate doctor, a researcher interested in the genetics of neural tube defects. He squeezed us in between appointments and immediately suggested she undergo a DNA microarray. Again, there was little discussion, our answer was yes since we needed answers and to be able to explain what was happening to our child. Within two weeks we had the results; and I distinctly remember the doctor call suggesting that we meet as soon as possible. While a meeting was scheduled for the next day, I begged the doctor to give me the genetic results immediately. He reluctantly gave me her diagnosis with the warning not to go internet crazy. Too late for that—I stayed awake all night researching. I knew that the Human Genome Project was focused on completing DNA mapping. And since this project started in the 1990s, by 2005 many chromosomes were complete, including our daughter’s affected chromosomes, numbers 6 and 18. I printed off chromosome maps, researching what little I could find on exactly how these genes expressed themselves, crying over the statistics, and writing pages of questions. The next day we met, and while it was comforting to hear the information in person, he had little to add and no information on what it meant for her future. From what he had researched on the genetic databases available, our daughter was the only person listed with this specific genetic abnormality. No one else in the world had what she did. It was all unknown. I had my daughter’s diagnosis, one I thought I so desperately needed, and in the end I had more questions than answers. I remember crying and then stopping to chuckle. The doctor was taken aback and I remarked to him that how science works is funny, that the answers you find usually lead to more questions than definitive information. He nodded in agreement and yet understood the guilt that we instinctively felt. He was quick to point out that the tests we had opted out of during pregnancy would not have revealed this type of anomaly. But he did say that 95% of the time this type of genetic disorder is inherited from one of the parents, who have a balanced translocation. The emotions were overwhelming, could we have prevented this by having ourselves genetically tested prior to conception? The answer was no. Typical pre-conception genetic testing would not have determined a balanced translocation. That revelation was little comfort at the time. He questioned our desire to have more children and gave a high recommendation that we also undergo a DNA microarray. We readily agreed—how could we not? After all, we did not want to knowingly pass something on to more children. Two agonizing weeks later we were told that neither of us had translocations and Sarah was in the minority of children who do not inherit their disorders. It was good news for us, but that did little to comfort what was still happening with our daughter. And I was still in search of answers. And then one day it happened, BOOM, pregnant again. Nine months after we had Sarah, we found ourselves overwhelmed with the fact we were expecting again. We sat staring at each other questioning how this happened. OK, we knew how, so maybe we meant how could we let this happen? How could we be so careless? We were already barely coping with our day-to-day and now this. Yes, Sarah was in the minority non-inheritance group, but if it happened once to us, would it happen again? What would we do? How would we manage? Eventually we decided that we needed to undergo chorionic villus sampling. Yes, that is what we were advised to undergo, but we did not do it simply because we were told it was in our best interest, nor was this an easy decision. We knew that we would deal with what we were given in life, but we needed to be more prepared if a genetic issue were to happen again. I would be lying if I said we were not seeking reassurance as to the health of our unborn child, but we felt that either way we would rather have the knowledge that science could provide so we could better prepare for what was to come. We were cautiously optimistic when the results came back as normal. By this time we were well aware of all sorts of issues that can occur regardless of a current known genetic component. Even to this day after a clean bill of health and no major issues in five years, I still wonder what might be lying dormant just waiting for an emotional trigger to set it loose. We eventually put it all into perspective. We started to focus more and more on my daughter’s development and immediate needs rather than the bigger, long term picture. We started to become a family. We did end up seeing genetics and my one question to them was whether she was expressing more of the partial deletion or the partial trisomy. They looked at us dumbfounded. I asked if they had looked at her chart prior to walking in the room and knew they had not, otherwise they would know that we already had obtained her diagnosis. All the information was in her charts and we just wanted to know what they could add as geneticists. Their answer was that they did not know and to stay off the internet. Their resources for us were none. We provided them more information on our child’s diagnosis than they could. We gave them online resources for other families in the future. They in turn wanted to see us every six months to chart our daughter’s progress. In the end we opted out of doing that. It was one more appointment to keep with little reciprocal help. I often ponder how I feel about knowing a medical diagnosis for my daughter. There are certain benefits to having this knowledge. It is easier to obtain insurance approvals, to qualify for an IEP, to justify assistive technology, and to explain to friends and family. 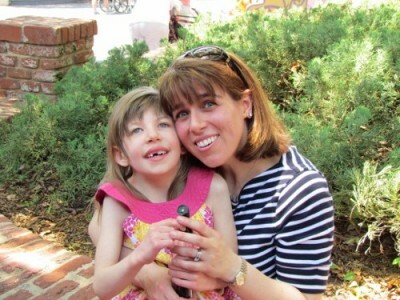 It is even easier to gain the respect of doctors, as I rattle off her diagnosis, Partial Trisomy 18q23 and Partial Monosomy 6q27, and sit and explain that diagnosis in layman’s terms so that they can understand. But I am also a mind wanderer, and I will sit lying awake wondering what it all means and what the future really has in store. How can I help to shape her future, is she happy, am I expecting too much, not enough, how many more surgeries, will she have friends, will she go to college, will she live on her own, and will she outlive me? These questions swirl in my head on a daily basis, yet most of the time I am scared to voice them to anyone for fear that they might have an answer I am not prepared to hear. On the flip side, I also find it all quite comforting. I believe that knowledge is half of the whole. And what we do with that knowledge is the most important. What I can do is advocate for my child. Due to the rarity of her genetic disorder we have been blessed that no one can put her life and its future in a box. No one even tries. They can’t tell me what typically can or cannot happen, they cannot tell me she will never be able to accomplish something. When I go to her team of therapists and educators and challenge them to come up with new ways of doing things, I am not met with resistance. Instead they rise to the occasion. They are willing to try. When I ask a doctor to try a different medicine he can’t say that my daughter won’t respond well to it. He can’t, because he simply doesn’t know. And so far the only thing I can say scientifically is that the best medicine so far is having a brother so close in age showing her how to do things and giving her the confidence that she can achieve whatever she desires. Life works in mysterious ways, and sometimes all of our scientific knowledge cannot shape human nature.